You’ve been flying your drone, getting those shots and now you have a tone of footage to deal with. I’m sure it’s all perfect and doesn’t need any editing but, just in case, here are my top three picks for free video editing software solutions for 2018. I tend to look for the whole package when it comes to editing my footage. I don’t want to be using multiple tools to get the results I’m looking for. The solutions I am presenting here are professional grade, not some quick clip editor with funny effects and so on. You can use them to make a quick edit but they are designed to be a one-stop shop and help you make a professional production from your footage. The 3 options listed here will work on Mac, Windows and two of them also have Linux versions. They are presented below in alphabetical order. When you’re done here you should also check out my Free Music for Videos – Sources for Your Next Project post. How do I use these applications? Sure, you could just upload your 20 minute video to social media and be done with it, but, I’m willing to bet, there’s some dead time in there where you might be positioning your self to get that perfect shot or some unwanted footage somewhere that you’d prefer to take out. Maybe you have a few files you’d like to combine into one production or add some cool titles, sound effects, music, a voice-over, transitions and so on. That’s what post-production is all about. Taking that raw footage and editing it into the perfect production piece. Another reason to edit your footage in a video editing solution is to be able to change the format to better fit your intended playback destination (i.e. you shot in 4K but it’s going to be played back on a 1080P television). One example would be to convert your 4K footage to 1080P or other lower resolution as a way to zoom in on a particular area. You can even speed up and slow down your shots to get that effect you’re looking for. OK, so this one’s not totally free but you get to try it out for free for 30 days. Adobe Premiere is probably one of the better known solutions out there. Mainly because Adobe creates great products for media professionals and does an excellent job getting their brand out there. Adobe Premiere Pro is quite the powerhouse. It allows you to edit your footage, add text and graphics, adjust color, refine audio and much more. You can import your footage from any camera and use the intuitive tools to edit them with ease. With integrated step-by-step tutorials you’ll be an editing master in no time. Premiere Pro allows you to have multiple projects open at once and even gives you the ability to lock your projects so no one else can edit them (for when you’re working in teams). It offers workflows for color, graphics, audio, and immersive 360/VR to help you get the results you need as quickly as possible. From your phone footage to 8K and VR, Premiere Pro has you covered with broad native media support. Although Premiere Pro is a stand-alone solution it offers seamless integration with Adobe’s other’s products such as AfterEffects, Audition, Photoshop and more making it quite the contender if you have the full Creative Cloud suite. Adobe Premiere Pro CC is part of the Creative Cloud suite and is constantly being updated with new features. As this is a subscription solution (i.e. you don’t buy the software outright but rather pay a monthly or annual fee to use it), the updates are made available as soon as they’re ready. No more waiting for the next major release just to get that one feature you want. Do yourself a favor and take a look at the 30 trial. If you fall in love with it, subscribe, if not, move on. At the time of this writing the subscription for just Adobe Premiere Pro CC is $21.99 per month, Creative Cloud packages are also available where you can select from certain packages (such as the Photography package that includes Photoshop and Lightroom) to an à la carte option where you pick and choose what you want to the full package that includes everything. Check it out here and decide for yourself. DaVinci Resolve combines professional offline and online editing, color correction, audio post-production and visual effects into one tool. One of the coolest things about this solution is you don’t have to go to separate tools to get your work done, it’s all there. 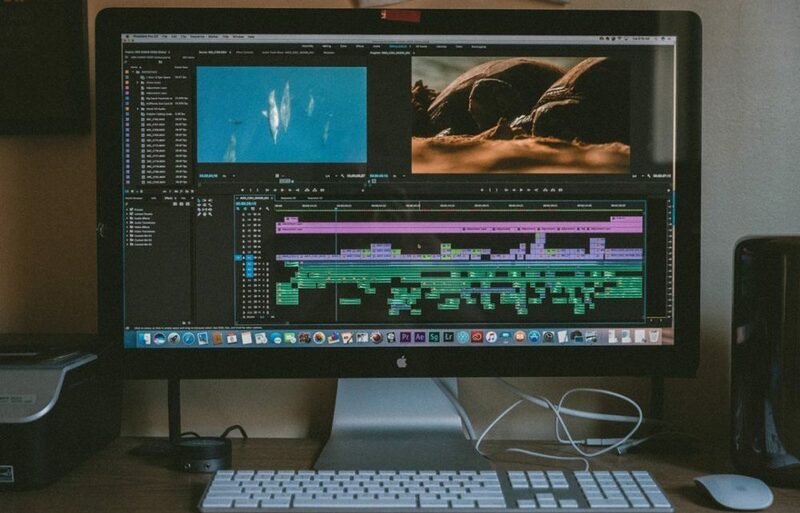 You have a real professional package here allowing multiple editors, assistants, colorists, VFX artists and sound designers to work on the same project at the same time. Recently added features include built-in visual effects and motion graphics. There’s a 3D work space with over 250 tools for compositing, vector paint, keying, rotoscoping, text animation, tracking, stabilization, particles and more. There’s even a sound library database! DaVinci Resolve also has tools for Multicam editing which is great for those of you that shoot scenes using multiple cameras to be able to get those perspective changes in sync. With the ability to create 2D and 3D titles you can really make your credits shine. DaVinci Resolve provides powerful color correction tools to help you get those flat images popping. With HDR support and curve editors you can get those shots cleaned up in no time. The primary correction tool uses traditional primary color wheels along with 12 advanced primary controls for quickly adjusting temperature, tint, mid-tone detail, and more. The audio editing features are full-featured in DaVinci Resolve. They include mixing, equalization and dynamics, plug-in effects and much more. The editing and automation allows you to edit 192kHz 24-bit source clips with automation for adjusting fade, levels and more, all the way down to individual audio samples! You can use DaVinci Resolve to import and organize your footage as well. You can organize clips and edit metadata with ease. You can add work to the render queue and, if you have the resources, even push processing off to another computer! There are multiple delivery options with export choices for the web, other applications or even theatrical distribution. If you’re looking to work in a team environment, DaVinci Resolve has you covered. You can lock clip, timeline, and bins so others in your team can’t make changes. There’s a built-in chat feature so you can stay in the app working and still communicate with other team members. There’s a timeline comparison tool to allow you to see the various changes and merge edits and you’re not locked down to specific storage solutions. DaVinci Resolve will work with any shared storage option. One thing that DaVinci Resolve offers that i haven’t seen from other’s (aside from 3rd party solutions) is its large selection of hardware control panels. They actually offer professional gear that works with their software package to provide you with physical sliders, buttons, displays, etc. allowing you to work more efficiently and with a degree of control not easy to obtain with a mouse and keyboard. Training isn’t really obviously available on their site. There’s basically a manual and a forum you can access. To really get going with this one you’ll have to go by trial and error or look for 3rd party sources such as YouTube, Google, etc. As with other solutions, DaVinci Resolve has a free and paid-for version. The free version is really feature packed however if you’re looking for multi-user collaboration features, 3D tools, dozens of Resolve FX and more than the paid-for option is the one you’ll want. Grab it here. Lightworks boasts that it has been at the forefront of film editing for over 25 years and has been used on many of the finest films in cinema history. It offers a simple and intuitive interface, timeline editing and trimming and the ability to export video in multiple formats including those used on online platforms such as YouTube, etc. Another big plus for Lightworks is the access it provides to royalty-free audio and video content to use in your productions as well as real-time, ready-to-use audio and video FX with built-in presets. Those of us with less than the latest power-rigs will appreciate the low-res proxy workflows for 4K. What this means is instead of working with the full res 4K video files we work with lower res versions allowing us to make the changes we want quickly because our machines aren’t choking while trying to process the full res files as we edit. This solution is optimized for speed and offers background importing, rendering and exporting. One of the features that brings Lightworks to the forefront is it’s Multicam editing ability. For those of you that shoot a scene with multiple cameras you now have an easy to use tool to sync that footage up an edit it as if you were working with one. You can also create pretty intricate text effects for use in your productions. You have the ability to customize your work space to make your editing experience your own. Don’t worry about learning how to use this solution as several tutorial videos are available and there’s a robust online community of people willing to help out with any questions you might have. Lightworks is offered 4 different ways. There’s the free option which will give you quite a bit of functionality but, as with most free versions, has some limitations. Then we have the full version, offered 3 ways. You can subscribe to the software on a monthly basis, annual basis or you can buy it outright. Regardless of the purchase option you choose, you will get the full version of the application however, if you choose the annual subscription option you can choose one of two plugin packages and if you choose to purchase it outright you will receive both plugin packages. The free and monthly options do not include any plugin packages. Take the plunge and test out the free version to see if it will fit your needs. If so, great. If not try one of the other solutions listed in this post. Download a copy here and check it out. The best way to start figuring out how to use these applications is to just get in there and play around with them. Once you have a feel for the layout and what some tools do take a look at the built-in tutorials, tutorials, videos and forums provided on the company web sites. After you’ve absorbed the program provided training conduct a few searches in YouTube and Google to look for those specific how-to’s for the tasks you’re trying to accomplish. Chances are you’ll find exactly what you’re looking for and, if not, something close to it that will help you in your endeavor. Scott Kelby – I’ve actually met him and had the privilege of attending a photography workshop with Bill Fortney, Scott Kelby and several others. Scott’s a pretty cool guy and knows his stuff. I highly recommend you check out his books and trainings. Tips, runs Best App Site and Terry White’s Tech Blog. He’s definiely worth following. Chances are, if you’re looking for inspiration or a how to do x tutorial, you’ll find it at KelbyOne. There you have it. My top three picks for the best free video editing software solutions for 2018. Check them out, see what works for you and what doesn’t, take a look at the training and support options. Decide for yourself and go from there. There’s nothing that says you have to pick one over the other. If you’d like, keep all of them and use them as you see fit. In the end what works for you is what’s best. Do you have a vote, one way or the other, for any of these? Did I miss a feature that should be listed? Do you hate my picks and think something else deserves to be here? Do you have better training sources that I should include? Let me know by commenting below. DJI Mavic – Which One to Choose – Updated! Thanks for checking this post out. Premiere is a great program and, if you’re already subscribing to Creative Cloud, it might make sense to add/use it. The other options give it a run for it’s money though and, since they’re free, beat it out in my opinion. I did do a review of the Mavic Air. You can find it here: What about the Mavic Air – This is a Site for Everything Mavic Isn’t It? If I were to pick between the two I’d go with the Mavic Air. Whichever you choose, I’d love to hear about it. Wow, there is so much to learn on your site about making and editing videos! I have dabbled with small videos on my phone and longer videos on my more old fashioned video camera but I’ve never had an editing program. Can you recommend a free for now video editing program for beginners? Just something to learn the basics before moving on to the pro and paid programs. Would you recommend the free version of the Davinci program to start or would this be too much for a beginner… I would love your input on this. Thanks! That’s a tough call. If you have a Mac and just want to dabble, I’d say give iMovie a try. Of the options I’ve listed in this post, I’d lean toward Lightworks, if for nothing else, for the training and online community to help you out. DaVinci Resolve is a great option but might be a better fit once you have some experience under your belt. Hi, I just came over from your top gift choice post. You’ve met Scot Kelby? Wow….. I will definitely be spending some more time looking at your website(s). Are any of these programs that you mentioned above any easier to use that the Adobe Premier? Or maybe the better question is Adobe Premier just as “challenging” to learn as Lightroom or Photoshop? I’ve sort of got Lightroom figured out after attending multiple live workshops. Photoshop…. I try to convince myself I don’t need it. For a myriad number of reasons, I know that I need to start doing more videos, not just those with drone footage. Yes, I was lucky enough to be on a photography workshop with Bill Fortney, Wayne Bennett, Richard Small and Scott Kelby back in 2010 (https://scottkelby.com/join-me-bill-fortney-for-a-landscape-photography-workshop-out-west/). It was an awesome experience and, when we broke up into vehicle groups, I jumped at the opportunity and joined them in theirs. I guess I was in awe because I remember saying Facepage to Scott Kelby instead of a Facebook page and he laughed at me, LOL. Anyway, I learned quite a bit during that event and even ended up in one of Scott’s books (The Adobe Photoshop CS6 Book for Digital Photographers). The image is actually from that trip. Apparently I was a “Little Problem” as that’s the title of the section you’ll find me in, starting on page 212. Back then I was traveling the country, selling my photography at art festivals. My old site is still up but hasn’t been updated in a long time (http://www.scotthinklephotography.com). So the programs I listed are “professional grade”. They have all the bells and whistles. As for their learning curve, it’s a bit high to learn it all but the basics are pretty easy. That said, if you’re already a Photoshop/Lightroom user, you might be better off sticking with Premiere. In any case, there’s plenty of training available online and, of course, there’s also a KelbyOne subscription.